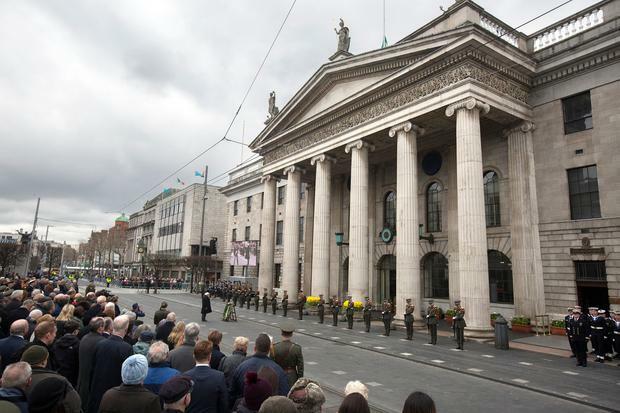 President Michael D Higgins lays a wreath at the Easter 1916 Commemoration ceremony at the GPO. An Post is looking to move its headquarters out of the GPO as part of a major transition that could see hundreds of jobs being lost. The company is inviting 1,200 of its staff and managers to take voluntary severance from its corporate and support services next month. Most of these workers are based in the GPO. It is estimated that 200 to 300 people will be made redundant. This is part of a major shake-up from An Post, which is also considering leaving its headquarters in the GPO. According to chief executive David McRedmond, its offices in the historic building are “dilapidated” and “no longer fit for purpose”. “It is 34 years since the last refurbishment and this time lapse far exceeds the accepted norm of 15-20 years for an office refurbishment,” he said. “Initial estimates to refurbish the building are extremely high requiring a budget of tens of millions of euro and will take a long time to complete, especially as much of the building is listed. “We have made no decisions yet and will consult with staff, unions and Government (the owner of the GPO). First opened in 1818, and extensively refurbished just before the Easter Rising, the GPO was all but destroyed during Easter Week with just the portico, pillars and part of the façade remaining. In the 1920s, the GPO was rebuilt with a slightly different interior layout and reopened in 1929. Commenting on the loss of jobs, Mr McRedmond said it was the latest step in the company’s plan to modernise its business. This news comes after the Irish Independent revealed that the west of the country looks set to lose dozens of post offices. An Post said the 161 postmasters’ offices, from among a network of 1,111, were now “likely” to close as the postmasters there were seeking redundancy. A leaked document showed how rural areas in the west are particularly exposed in comparison to eastern areas. Negotiations with postmasters are ongoing, with a final announcement expected later this month.